At PAX East 2013 last weekend, I had the opportunity to sit down and play a round of the competitive mode of Dungeon Defenders II (henceforth DD2). I also got to talk to Philip Asher (Marketing Director and Designer), a.k.a. pmasher. While the co-op mode of DD2 is still mostly under wraps, Philip was able to give me some details on it which I’ll gladly share with you guys. Let’s first talk a bit about the competitive mode that I played. The competitive mode of DD2 is basically a MOBA. The map I played had three lanes and was the standard 5v5 set-up, pitting the heroes of the game against each other on two teams. Players can buy items from the fountain (spawn point), but at the moment they are limited to consumable items (e.g. potions, wards, etc.). 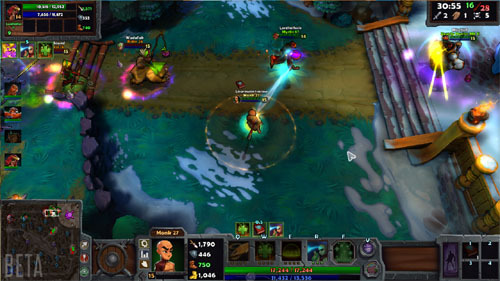 One team wins when the other team’s fortress dies, but they must push down the lanes and destroy towers in order to accomplish this. Unlike the top-down design of many MOBAs, however, DD2 also has a close-up third person perspective option (which is what we were playing in), a lot like Smite for those of you who have played that. Heroes in the competitive mode do not drop towers as their skills, but instead have four skills (one an “ultimate” skill) that provide helpful or harmful effects to friends or foes. Things that I noticed from the competitive mode that would be the same in the co-op mode included the following: the graphics have been upgraded, but still possess the same style that we know and love from the first Dungeon Defenders. Movement also felt a bit more responsive to me than the first game. DD2 will feature 24 heroes on launch which will be the same in both competitive and co-op mode. It will have an unlock system with rotating free heroes. Philip told me that when you unlock a hero, it will be available in both competitive and co-op, so no need to worry about that. Heroes can be unlocked via in-game currency that you can earn in both modes, or you can opt to buy this currency with real money if you want them right away. So let’s talk co-op now. I told Philip was that I’d seen some of our readers voice concern over a couple factors of the DD2 announcement. First was that Trendy had started off by highlighting the competitive mode, making some people wonder if this was going to be the main focus of the game. He assured me that the focus of DD2 is still co-op, and that the core gameplay for the co-op mode would be mostly the same, but with more content. While they’re looking forward to introducing the competitive mode in DD2, it’s more of a complement to the co-op mode, and certainly not a replacement in any way. Trendy’s well aware of what fans love about Dungeon Defenders, and they have no intent of ruining that. 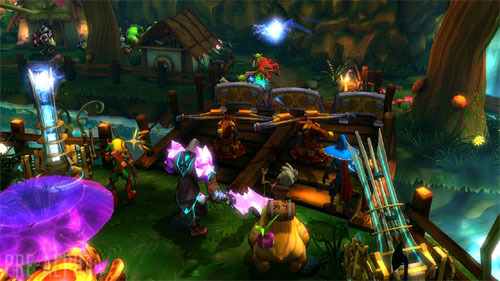 The co-op mode will support 4-player co-op still, and feature a 24-player tavern where dungeon defenders can meet up and get into a game together. The co-op mode will also be much more story-driven than the first game, and players will progress through the story together, something he seemed quite excited about. Since the game will launch with a whopping 24 heroes, Trendy will have to do some heavy balancing for the co-op mode, which may well be a reason the co-op mode is still in pre-alpha compared to the competitive mode’s closed beta. The second concern we talked about was fans’ trepidation about the Free-to-Play (F2P) model. He told me that the reason Trendy went in this direction was to get more people in the game playing together. He’d heard from numerous fans that said they loved the game, but couldn’t find anyone to play with, or when they found a game they got kicked out because their level was too low. A F2P model allows them to have servers with tons of people of similar levels who can meet up and play together, hopefully avoiding this problem from the first game. Trendy hopes that it will not only increase the longevity of the game, but also afford players with a better experience when playing the game. That’s all I have for you guys right now, but I left my interview with Trendy feeling much assured that they know what we like about Dungeon Defenders and they have every intent on making DD2 bigger and better. For a bit of a teaser, you can check out their co-op mode video for yourself, launched last Friday. 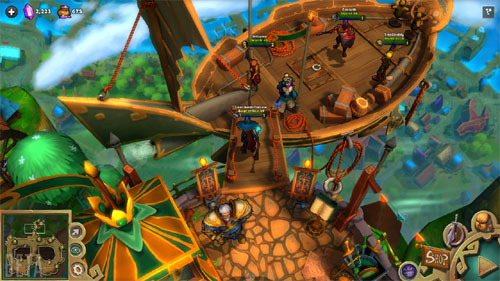 Dungeon Defenders II is currently being developed for PC, Mac, Android, and iOS with cross-platform support. It will support 4-player co-op and the release date is currently unannounced.